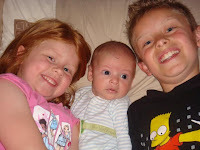 3 of my Grandchildren, Katie, Liam and Ryan taken a couple of days ago. 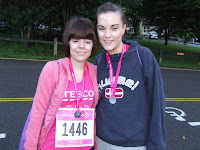 My girls after the Race for Life which they did last night. I am so proud of them. They walked 5km in an hour and were muddy and worn out but elated and buzzing and are all set to do it again next year. There was an amazing atmosphere there and I wish I could have done it with them! I must be feeling better as I had enough mojo to put this together this morning!! PP papers, SU notepad punch and Edwin in front of the wall coloured with copics. I have caught this rotten cough/cold and sore throat bug and feel rotten so there won’t be much from me for a couple of days, no mojo!! It has been a miserable, dark and wet bank holiday and I feel in need of sunshine desperately! My girls are doing the Race for Life on Wednesday and I am hoping the rain will let up for them. I am due to have a B12 injection tomorrow so fingers crossed that bucks me up a bit!! 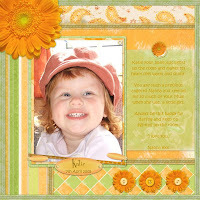 I will leave you with an old scrapbook layout of my Grandaughter Katie that always makes me smile! She was 21 months old in the photos and has such a wonderful smile, bless her. I hope you are all having a better bank holiday than me!! 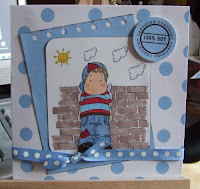 I saw the QK 12″ border dies the other day and thought I wonder if I can make something similar in the Design Studio so set about it and these are the borders I created (the negative cut) I am chuffed as they look really cute either as a strip cut out of the negative or the positive cut so you get 2 lots in one. I adore the brackets as these are quite ‘in’ at the moment. I learnt from Caz how to make them using the SU tab punch which is a great idea but you are restricted to one size, on the Cricut you can have them whatever size you like and the bit in the middle is a cute shape too! The tulip border is lovely as it is but if you cut the tops of the flowers off you have the cutest grass to use on a card or layout. 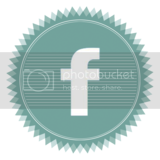 Ignore the blank space, that idea didn’t work first time!! Carts used: WIMG, PS, PDDU and the WIMG cart has the border feature so these are really simple to make and if you weld several cuts you can have them as long as you like!! 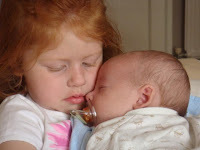 This is my Grandaughter Katie with her new baby brother Liam. I just love the expressions on her little face!! My baby and her baby!! 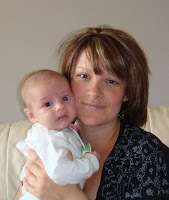 This is my eldest daughter Louise and her new son Liam, she sent me this photo this morning by email and it bought tears to my eyes. She is such a wonderful Mum to all 3 of her beautiful babies. 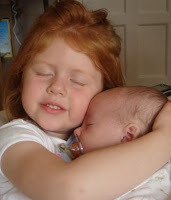 I have always said my children are my greatest achievement in life and on my down days all I have to do is see or speak to her and my grandchildren and I remember what life is all about.